Industrialization has led to an uncertain increase in the environmental pollution, which is giving birth to a number of respiratory diseases such as asthma and COPD (chronic obstructive pulmonary disease). The global market of respiratory inhaler devices is on a high pace due to rapid increasing respiratory diseases. Tens of millions people suffer from lung cancer in U.S due to industrialization which resulted into increased environmental pollution, smoking etc. In 2015, global revenue generated by respiratory inhaler devices stood at USD 30 billion witnessing a compound annual growth rate of 4.3% over the forecast period i.e. 2016-2023. MDIs (metered dose inhalers) constituted the largest market share among inhalation systems followed by dry powder inhaler which is used for treating cystic fibrosis, a life threatening lung disease. In 2015, MDIs segment accounted for 70% of the global revenue. North America is anticipated to hold the largest consumer base of respiratory inhaler devices followed by Western Europe. North America and Western Europe collectively accounted 65% of the total respiratory inhaler device market in terms of revenue share by the end of 2015 owing to the increasing environmental pollution due to industrialization and smoking habits which is commonly found among youngsters. The immune systems of children and older adults are more prone to chronic respiratory diseases; respiratory inhalers devices are anticipated to experience a huge demand in the near future due to increasing number of respiratory patients. It is concerning that the global asthma patients which are substantial in numbers seem to be increasing rapidly as the world becomes more westernised. Developing countries are more vulnerable to respiratory diseases due to poverty that exacerbates risk factors such as indoor air pollution and tobacco consumption, government of these countries are taking strategic and collaborative actions to diagnose and manage respiratory health problems in their countries. Increasing health awareness coupled with increasing personal disposable income which will result in increased sending on respiratory problems, this will further surge the demand of respiratory inhaler devices in the upcoming 5-6 years. 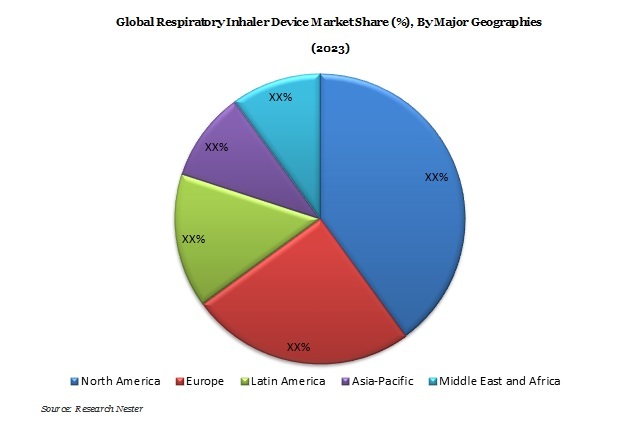 The major factors that are driving the global respiratory inhaler device market includes increasing prevalence of respiratory diseases such as asthma, COPD and emphysema, growing need for rescue medication during sudden asthmatic attack and technological advancement in the products. Industrialization which leads to environmental pollution as well as respiratory problems, feasible inhaler devices available in the market and faster delivery are some of the factors that will boost the demand of respiratory inhaler devices over the forecast period. Factors such as non-standardized dosage for patients, technical problems in inhaler design and lack of effective drugs for certain respiratory disorders, high cost associated with the product, side effects and complications are some of the factors that are anticipated to restrain market growth over the forecast period.